With two weeks to go till various IMAX cinemas in the UK show us a 6 minute preview footage, supposedly a prologue regarding the main villain of the piece - Bane. The Dark Knight Rises viral marketing has stepped up it's intensity. In a similar fashion to the Inception viral parts of a wiki leaked style C.I.A report were sent to both Wired and Empire Magazine. Wired received the first page of the bulletin, which is a report regarding the disappearance of Doctor Leonid Pavel, a 63 year old Russian Nuclear Physicist last seen in Chelyabinsk, Russia. 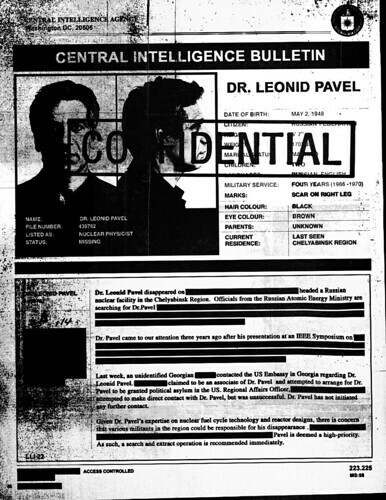 In The Dark Knight Rises Leonid Pavel is the character played by Alon Abutbul. So far all we can divine from the pages is that he was last seen in Chelyabinsk, which was at one time the former Soviet Union’s main military production centre. Pavel was born around the time the many Chelyabinsk residents were feeling the effects of radiation poisoning. Leonid Pavel is probably very knowledgeable in the realm of Nuclear Energy as he spoke at a IEEE (The Institute of Electrical and Electronics Engineers) symposium and the US Government believe that he is a high value commodity because of his knowledge of Nuclear fuel cycle technology and reactor designs. The Establishing Shot: The Dark Knight Rises leaked CIA report - Viral, a photo by Craig Grobler on Flickr. 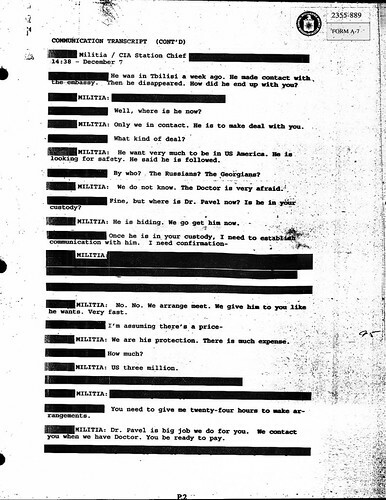 The second page is part of a transcript between a CIA Station Chief and a militia member, if this is a continuation of the previous page - this would be Georgian Militia. The contact is trying to negotiate safe passage and political asylum in the US. The Establishing Shot: The Dark Knight Rises leaked CIA Transcript - Viral, a photo by Craig Grobler on Flickr. So it would seem that Nolan is drawing on both reality and fiction for The Dark Knight Rises. Not only is there a strong implication of former Soviet locations, but shadowy military connections and agendas. Much like the story line of Call Of Duty. In which a former Soviet causes World Wide War with the end game of destroying America. This is not the first time Christoper Nolan has drawn on game concepts, for Inception the attack the snow fortress had a lot of similarity to a COD game level. For now we assume Bane has captured Leonid Pavel and is using him for his own nefarious needs, which no doubt include an attack on the US and more specifically Gotham City.